리비아의 수도인 트리폴리에서 서쪽으로 약 70km 떨어진 사막지역의 알소르만 시티 외곽에 있는 91헥타르 규모의 대지에 열악한 환경을 개선하여 편리하고 안락한 도시주거 환경과 인프라 제공을 목적으로 계획되었다. 초등학교, 중고등학교, 모스크, 마켓, 유치원, 클리닉 등 7종류의 연면적 약 24,000㎡의 서비스 빌딩을 중심으로 2~4층 연면적 약 205,000㎡(1,000세대)의 주거 시설이 배치되었고 도로, 상하수도 및 전력공급을 위한 도시 인프라 시설도 설계되었다. 100여 년 된 야생 수림대에 접하며 남쪽으로 완만히 경사진 대지 조건에 따라 기존 지형의 변형을 최소화하여 42%의 녹지율과 4,000톤의 관개용수를 사용하는 친환경적 주거 단지로 리비아의 녹색 보석이 될 것으로 기대한다. The pressing mandate of this housing project was to improve the sub-optimal living conditions and provide convenient and pleasant urban housing and infrastructure. The site was a 91-hectare desert land in a poor condition, located at the outskirts of Al-Sorman, 70km west of Tripoli, Libya. The program includes 7 service buildings – elementary & high school, mosque, market, nursery and clinic – with a gross floor area of 24,000㎡ that will sit in the center, around which 2~4 story residential buildings (GFA 205,000㎡; 1,000 units) are planned, supported by the urban infrastructure of roads, water supply & sewage and electricity. The project made minimum alteration to the natural environment of the site which is sloped in a gentle angle and neighbors a 100-year-old wild forest, enabling a green area ratio of 42% and 4,000 tons of water use for irrigation. 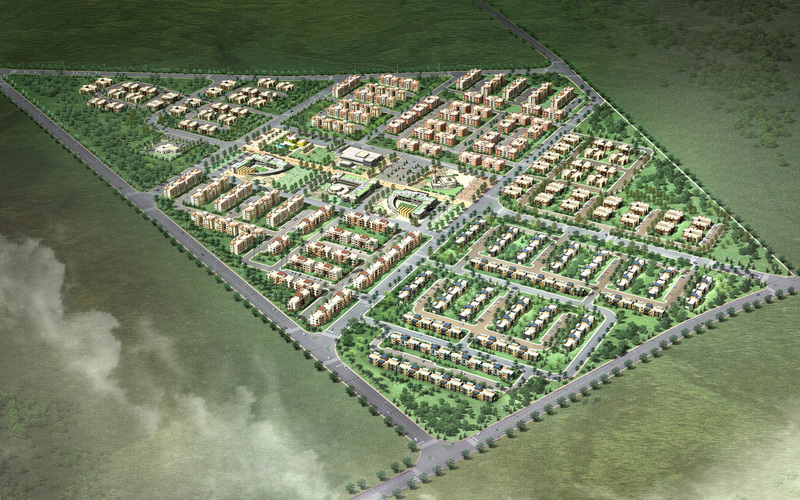 This eco-friendly community is expected to emerge as the ‘green gem’ of Libya.